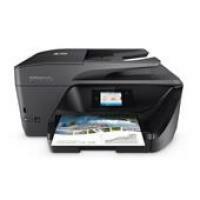 HP OfficeJet Pro 6970 All-in-One printer is a multi-functional printer which can print, scan, copy and fax the documents. Black body, matte finish and curved edges describe the appearance of the printer. It has 46.3 x 39.0 x 22.8 cm physical dimensions with 8.1Kg weight. The printer has a 2.65” touchscreen for easy navigation or direct printing. This printer is flexible with operating systems- MAC and Windows series. The printer has a 225-sheet input tray, 35-sheet automatic document feeder, and a 60-sheet output tray. The printer is flexible with various media types and multiple connectivity options. By leveraging HP ePrint, Apple AirPrint, Mopria, and wireless direct printing, one can easily print or fax the document from anywhere. The printer offers business quality print with high printing and a scanning resolution of 600 x 1200 dpi and 1200 x 1200 dpi respectively. Setting up the printer is an easy process. One can link the OfficeJet Pro 6970 using Wi-Fi, USB or LAN, during the setup. The driver automatically detects Wi-Fi and link-up with the printer without any manual intervention. To provide good quality print, the printer uses 4 HP OfficeJet Pro 6970 ink cartridges. The separate ink cartridges allow low maintenance, as one has to replace only the expended ink cartridges. HP OfficeJet Pro 6970 printer is a multi-functional inkjet printer backed with multiple wireless connectivities for easy printing from anywhere. It has a touchscreen to print, scan, copy or fax the documents directly from the printer. This printer is perfect for small businesses. How to replace HP OfficeJet Pro 6970 ink cartridge with a new one? Step 1: Make sure that the printer is on and loaded with plain white paper. Step 2: Slightly hold the handles on either side of the printer and raise the HP OfficeJet Pro 6970 ink cartridge access door until it is locked into the door. Step 3: Now, the carriage moves to the center of your printer. Before proceeding, wait until the carriage is idle and stops making noise. Step 4: Lift the lid on the ink cartridge slot and push the lid back to release the already installed HP OfficeJet Pro 6970 ink cartridge. Step 5: Remove the new cartridge from its original packaging. Make sure that you don’t touch black plastic on the ink cartridge. Step 6: Also, do not touch the ink nozzles while removing the plastic tape from the ink cartridge. And avoid replacing the protective tape on the contacts else handling these parts can result in bad electrical connections and ink failures. Step 7: Insert the new ink cartridge and slide the ink cartridge forward into the slot by holding them by its sides. Once, the ink cartridges are inserted, secure them into the place by closing the lid. Step 8: If needed, install all the necessary ink cartridges by repeating previous steps. Step 9: After you have installed the new HP OfficeJet Pro 6970 ink cartridge in your printer, the printer automatically prints an alignment page. You can now close the ink cartridge access door. Step 10: Wait until the alignment paper is fully ejected. After the printer is fully ejected from the printer, lift the scanner lid and place the alignment page (with the print side down on the scanner glass). Position them. Step 11: Close the scanner top and press OK.
By above-mentioned instructions, you might get the problem resolved for replacing the ink cartridges. Even if it does not help, call the HP support for an expert help. Q. What is the page yield of each of your compatible HP OfficeJet Pro 6970 ink cartridges? A. We provide two types of ink cartridges for this printer. 903XL cartridges are available in all colours (Black/Cyan/Magenta/Yellow) and can print up to 830 pages each. The 907XL cartridges are only available in Black and are capable of producing up to 1500 pages each. Q. How can I track the order of the HP OfficeJet Pro 6970 ink cartridges that I placed yesterday from your site? Q. I have a few questions regarding your product. How can I get in touch with you for any query? A. To get in touch, you can call us at 048 30833221 or email us at info@printerinkcartridges.ie . We will be able to help you. Q. What options are available for the payment of HP OfficeJet Pro 6970 ink cartridges? A. You can make your payment using Laser Card, American Express, MasterCard or Visa credit card, Maestro, Switch, Solo or Delta debit card and PayPal for all our products. Q. What is the use of maintaining the printhead of the HP OfficeJet Pro 6970 All-in-One printer? A. Maintaining the printhead can lead to better quality of output. If your printed output is streaked or has any incorrect or missing colors, cleaning the printhead can solve this problem. There are three stages of cleaning. If print quality still seems poor after you complete all stages of cleaning, you should try aligning the printhead. If the printer status page shows any streaking or white lines through any of the blocks of color or if you are having issues with the print quality, then also you should align the printhead. Q. What interfaces does the HP OfficeJet Pro 6970 All-in-One printer support? A. This printer supports USB 2.0, Ethernet, Wireless 802.11b/g/n and RJ-11 fax.